First Data hit the public markets on Thursday. The results weren't great, the payments processor priced at $16/share well below the expected range of $18-$20. On the first day of trading the stock priced crawled up 2.43%, but ultimately closed below its IPO price, at 15.83/share. 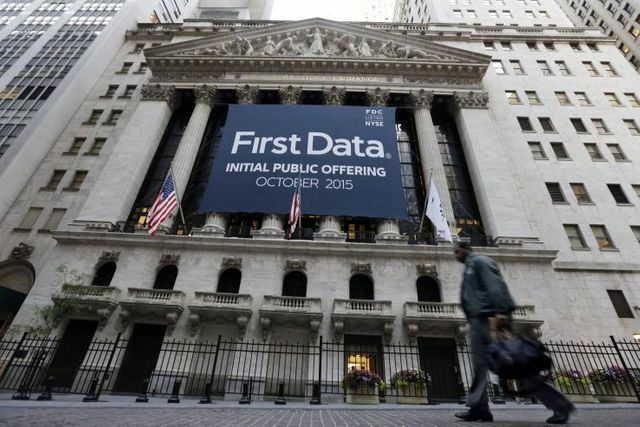 While First Data did not give a reason for its IPO pricing decision, some believe it was because of the iffy market for IPOs right now. Others cite the fact that the company is carrying a lot of debt, currently to the tune of $21.16 billion, with a lot of that attributable to that buyout in 2007. The IPO proceeds will be used to pay some of that down. First Data is unprofitable, in part because of the interest it’s paying on that debt. In the first half of 2015, the company reported a net loss of $138 million. There are also some external factors that may also impact how well First Data may do. For starters, Square also filed for an IPO just last night.